Biomedical engineering in Somaliland - This report was prepared for THET Somaliland to share the results of a baseline needs assessment of biomedical engineering (medical equipment maintenance and management) in Somaliland. The assessment was undertaken in order to identify key gaps and advice on appropriate capacity building opportunities to address them. 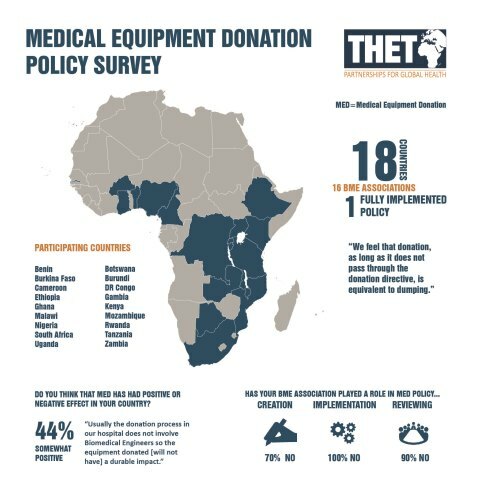 This infographic shows the results of THET's research into national medical equipment donation practice and policies in sub-Saharan African countries. equipment, it is not an exhaustive list or set of examples. In developing countries medical equipment is often non-functional. Well known reasons for that are donations of already broken equipment and lack of spare parts and consumables. At the end of 2015, THET organised a Needs Assessment workshop in Johannesburg for Professional Associations for Bio-Medical Engineering professionals in Sub-Saharan Africa. This article will describe the Health Partnership model and its application to the capacity building of medical equipment technicians. THET is collaborating with a significant number of global organisations that are engaged in medical equipment work in developing countries. Find some useful links to guidance and further information. At the request of the Zambian Health Ministry, THET performed a needs assessment of biomedical engineering personnel & training in public hospitals. The assessment determined that there was a significant shortage of qualified professionals at all skill levels. This maintenance guide for end users provides guidelines to care and maintain a range of equipment that are commonly used. The easy-to-follow User Checklists can be easily printed and kept beside respective equipment as a reference and reminder to end-users to conduct maintenance on equipment at regular intervals. This toolkit provides UK-specific guidance to health partnerships to assist them in evaluating whether or not to donate, and how to do so effectively. It aims to be a practical resource which also leads to an understanding of good practice for medical equipment donations. This resource identifies ‘Assumptions’; expectations which might be valid for high-resource settings but which are not necessarily valid for low – and middle-income countries (LMICs).